A contractor or handy person’s dream! A contractor or handy person’s dream! Built in 1911, this 4 BR, 1.5 BA American Foursquare-style home has great bones & just needs some TLC & updates to restore its original beauty. Situated on a 4,800 +/- SF lot located just off Pleasant St. near Newton Square, it provides easy access to public transportation, main roads, shopping, restaurants, recreation & schools. With 1,640 +/- SF of living space on 3 levels, this home boast hardwood floors & crown molding, arched doorways, window seats, living room with fireplace, eat-in kitchen, dining room, a spacious dormer/bonus room on the 3rd floor & an enclosed porch on the front. A full walkout basement offers 3 rooms & plenty of storage – laundry area with utility sink, workroom/playroom & mechanicals room. 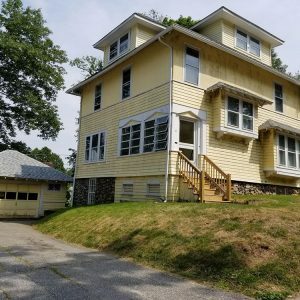 Detached storage garage & 4 +/- tandem parking spots in paved driveway; gas-fired steam heat; updated water heater; insulated windows and front door; circuit breakers; city water & sewer. Once renovated, it will be a gem! Come see for yourself! A 10% Buyers Premium will be added to winning bid to determine Total Purchase Price. A deposit of Ten Thousand Dollars ($10,000.00) by cash or certified/bank check will be required to be paid by the purchaser at the time and place of auction. The balance is to be paid by certified or bank check at of Attorney for Sellers office within (45) days from the date of sale. The successful bidder shall be required to sign a Memorandum of Sale containing the above terms and additional terms at the time and place of sale. Additional terms, if any, to be announced at the time and place of sale.